do double crochet, treble crochet and slip stitch. 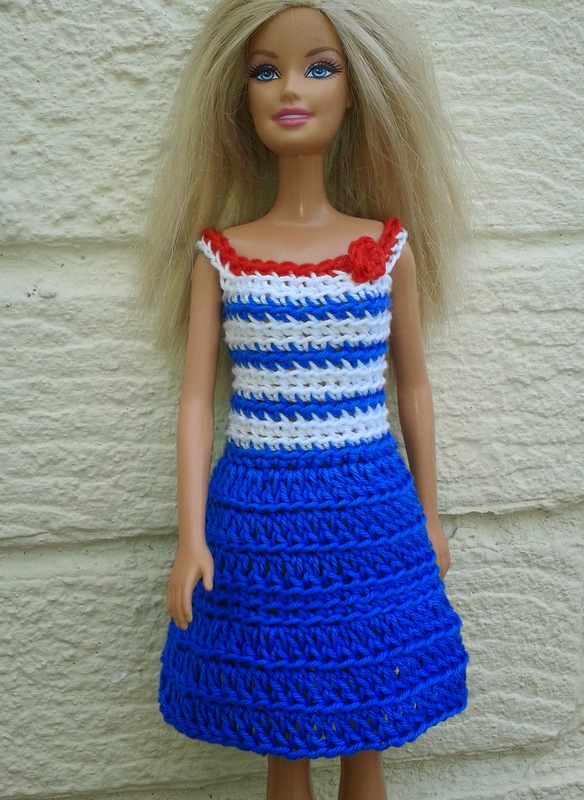 As the dress has no back opening and crochet is quite open be very careful when dressing barbie that her feet and hands dont catch the threads. If you make the dress please let me know if you find any typos or other mistakes so I can amend the pattern. And I would love to hear your comments. Notes: This dress is a close fit so any differences in yarn weight will make a smaller or larger garment. Cotton thread is not suitable. Round 13: 1dc in each of next 6dc, make 8ch, miss 2dc, 1dc in each of next 12dc, make 8ch, miss 2dc, dc to end. Round 14: using red yarn 1dc in each of next 4dc, miss 1dc, 1dc in each of next 8ch, miss 1dc, 1dc in each of next 10dc, miss 1dc, 1dc in each of next 8ch, miss 1dc, dc to end. Pull yarn through and fasten off. To finish - Pull yarn through and neaten all ends.